Torres Del Paine – W Trek – ¡Vamos! 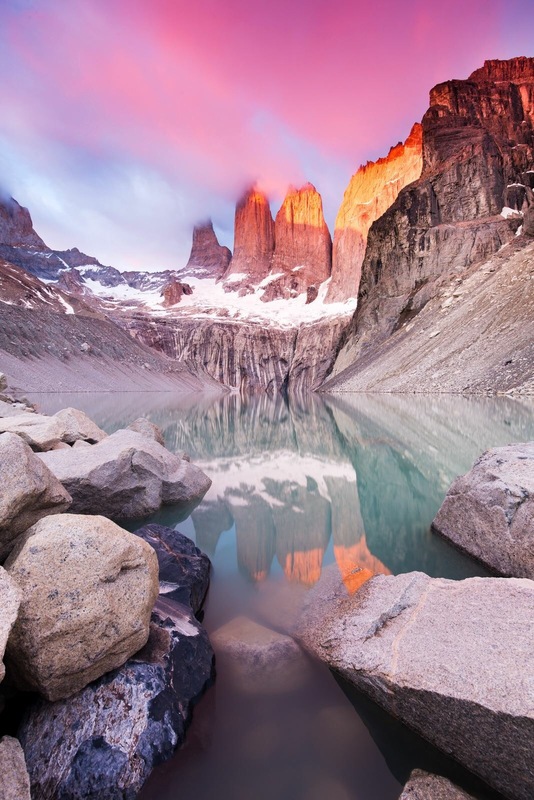 There are many ways to see the majestic Torres Del Paine National Park. You can do multiple day tours or trek. If you trek, you can stay in refugios or you can camp. We chose to do the W Trek in 5 days/4 nights by camping. I had allocated one day in Puerto Natales to prepare for our trek. Originally, I thought maybe we could eat at the refugios or rent sleeping bags and tent along the way but Marc wanted to go all out and really backpack. So we had a few hours to prepare everything we needed for 5 days- tent, sleeping bag, food, stove, gas, one set of dry clothes to sleep in. First thing we did was attend Erratic Rock’s free info session at 3pm which lasted to almost 5p! It is usually only 1-1.5 hours. So that ate up a ton of our time. We decided after the info session we wanted to do the trail exactly as they recommended, from West to East. Why do they say west to east? The trail from west to east gets harder and as your backpack load lightens each day, it’ll be better to do the harder part with a lighter pack. You can catch the sunset from Glacier Grey on day one and the sunrise at the towers on the last day. On day 3, you can camp at Italiano and leave your things there the next morning to climb the difficult French Valley. This sounded good to me so I cancelled and made changes to our original bookings at the refugio campsites (which was nice of them considering the website says no refund if changes are made within 30 days). One of the reasons I didn’t want to do this originally was because I didn’t know how the free campsites would be. Turns out, the free campsites we stayed at were actually our favorite ones! (This is only applicable to the W trek, I hear the toilets on the full circuit is a little different.) They have super clean toilets that you can flush. All you have to do is bring your own toilet paper. There is also a stream nearby each campsite for easy access to water. They also have designated cooking areas so there’s an area to eat. It’s way more than I expected. Below is a map of our trek. We didn’t have the official map on our trek and they didn’t have any at adminsitration. Luckily, we had the ones from the Erratic Rock info session that we took notes on. The signs are pretty clear though and you won’t get lost without one. In total, we hiked approxiamtely 74km/46 miles. We hopped on the 7am bus. You can buy roundtrip tickets from any hostel in town. We got to administration at around 9:30am, paid our fees there, listened to the rules and tips for the park, and then got back on the bus to head to the catamaran stop at 10a. Cool little tip from Erratic Rock: there is a hill across from the catamaran docking area where you can hike up a little for some awesome panoramic views. It was about 1.5 miles to and back. There’s nothing else to do while you wait to catch the 12pm catamaran anyway. Totally worth it. We took the catamaran to Refugio Paine Grande and hiked 11 km (6.82 miles) to Refugio Grey. There, we got our camp ready, ate dinner, and then walked another 15-30 minutes to the mirador Glacier Grey. You can get pretty close to the icebergs from there too. We were way too tired to wait for the sunset at 9:30p though. If you have an extra day, you can stay at Refugio Grey and walk up to El Paso the next day and get even closer to the glacier. People who did this said it was totally worth it. You can also kayak to it through the tour group Big Foot. I wish we had an extra day! The next day, we hiked back down to Refugio Paine Grande. They have a really good market here- they were the only ones we saw that sold produce. We picked up two packs of cold cut meat, some proteins bars, and dried fruit here. It cost us US$42! Such a rip off, but it was necessary. We had no protein except from the trail mix we brought. It was also really good that we stocked up here because Refugio Cuernos has a non-existent market pretty much. Then we continued to hike 7.5km to camp Italiano, a free campsite. Again, awesome campgrounds. They have an outhouse with flushing toilets and a huge waterfall/stream for fresh water. This was a long day. We got up at 5am to head up through the steep French Valley. The mirador beyond Camp Britanico was closed so we stopped there. So glad we did this without a pack. Then we rushed to Refugio Cuernos. Thank god we had reservations there. Erratic Rock recommends getting here before 4pm but really you should get here ASAP because the good camp spots fill up fast. Even the reserved spots. We weren’t even there during peak season! We later met people who were turned away because it was too full (they were forced to turn back along the same trail and walk another 1.5 hr to camp Frances). Cuernos was definitely our least favorite site. There were a bunch of big, tour groups and it was filled with not your typical backpacker. They also ran out of dinner and boxed lunches. It was pretty cloudy on our way up to Las Torres too. We couldn’t really see the towers. Erratic Rock recommends going up to the towers once you get there just in case it gets cloudy the next day. We didn’t do it because we were too tired. Broken ladder across the river. We ended up walking through the dry river so it was ok.
View from our tent. Not bad waking up to this. We woke up at 4am to catch the sunrise at the towers. We took our sleeping bags with us and hiked straight uphill for 45 minutes to the mirador. We got up there, bundled up, and waited. Unfortunately, it was too cloudy and the sun never hit and the towers didn’t come out until 8am. It was still cool though. The weather was bright and sunny pretty much for the rest of the day after 8a. Backpacking the W Trek is possibly one of the coolest things I’ve ever done. There was always something to see on the trail, it wasn’t repetitive, and there were 360-degree views everywhere. My panoramic pictures couldn’t even capture it. It helped a lot that we had almost perfect weather everyday. It was a little bittersweet when we finished but I was excited for some real food, a real bed, and not freezing at night! Our first meal after the trek: we splurged a bit for dinner at Afrigonia where they served African/Chilean food. It was good! (Although we were hoping for something heartier). The next day was Thanskigivng and Erratic Rock hosted a big dinner! We missed the food, but drank the night away with some of our fellow backpacking friends we met along the way. Definitely a great way to wrap up our time in Puerto Natales!